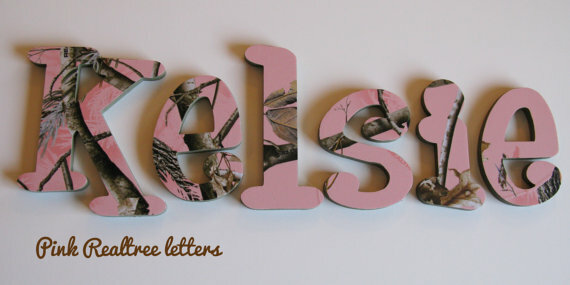 These letters are the cream of the crop to finish off your daughter's hunting camo room or nursery! Letters are available in many different sizes from 7"- 16" and are cut from the sturdiest wood available, 1/2 Baltic Birch. You many also choose all capital letters for an additional fee. Letters are done in Pink Realtree Hardwoods Camo print.These are hand crafted not hand painted. Chose your font! You can see your name in all the fonts we offer just click font preview tool!. Letters are made by hand by myself and take approximately 6-8 weeks for completion. If letters are needed sooner you can purchase a rush order available for purchase in the store (just type rush in search box).